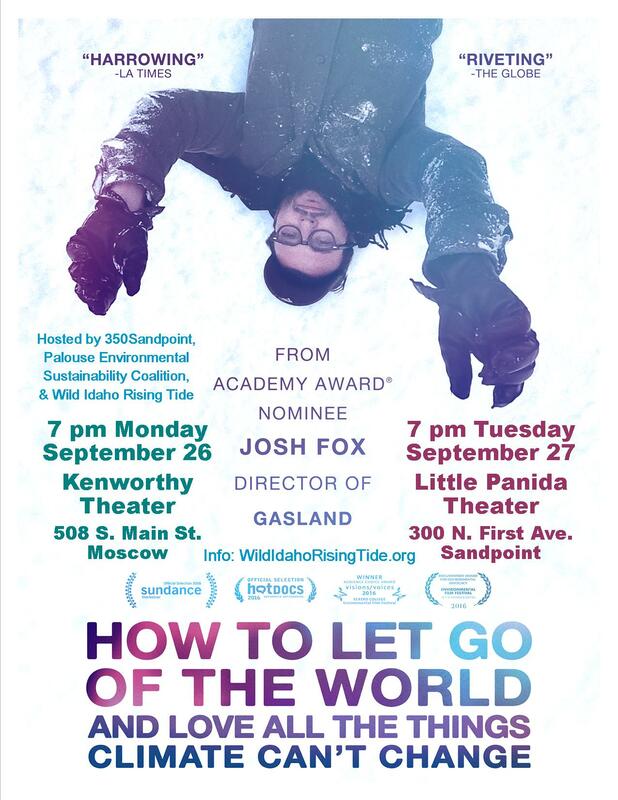 On September 26 and 27, three regional, climate change-concerned groups are hosting public screenings and discussions of How to Let Go of the World and Love All the Things Climate Can’t Change. In his deeply personal style, the Oscar-nominated director of Gasland, Josh Fox, continues to investigate climate change – one of the greatest threats our planet has experienced. Humanity is facing a difficult period of change; this film explores the values needed to wisely navigate this transition. Co-hosts 350Sandpoint, Palouse Environmental Sustainability Coalition (PESC), and Wild Idaho Rising Tide (WIRT) welcome everyone at these events offering free admission and accepting donations at the door and at group information tables in the lobby. Screenings start at 7 pm on Monday, September 26, at the Kenworthy Performing Arts Centre, 508 South Main Street in Moscow, and at 7 pm on Tuesday, September 27, at the Little Panida Theater, 300 North First Avenue in Sandpoint. Conversation after the film will explore audience member reactions, renewable energy transition and climate change challenges in Idaho communities, and local and Northwest participatory movements seeking climate justice and solutions. People have already significantly warmed the Earth and oceans by one degree Celsius, melting and diminishing frozen glaciers, polar ice caps, and continental ice sheets, and making the atmosphere four percent wetter. In addition to these huge changes, another half degree of warming will likely occur, from carbon dioxide and methane already in the atmosphere. Scientists warn that two degrees Celsius of warming could provoke unstoppable processes that raise sea levels by five to nine meters. Environmental analyst Lester Brown advises that we must reduce greenhouse gas emissions by 80 percent by 2020, to stop Greenland ice sheet melting. But fossil fuel use is actually expanding, and emissions are increasing. In desperate attempts to prolong its reign, the fossil fuel industry is rushing to switch current energy sources from coal to natural gas, via extraction methods like fracking and acidizing, while pushing through thousands of miles of pipelines and oil and gas transfer, storage, and port facilities. The entire natural gas production process, from extraction to delivery, leaks large amounts of its greatest component, methane, a greenhouse gas 86 to 104 times more potent than carbon dioxide in the short-term. Besides fossil fuel combustion, animal agriculture also contributes to climate change, releasing nearly 20 percent of global greenhouse gas emissions. Unsustainable factory farms use vast quantities of water, and cause much of worldwide deforestation. For decades, individuals have taken small steps to stop climate change, by consuming less meat and dairy, using alternative and public transportation, implementing energy efficiency, and switching to renewable energy. But as the fossil fuel industry expands, many communities are fighting pipelines, compressor stations, power plants, export terminals, and other development projects. The global struggle against climate change entails thousands of local resistance battles that we all need to win. With tough times ahead, strong communities are our best assets for overcoming climate change. Friends, families, co-workers, and neighbors gathering to talk, learn, brainstorm, and decide what they can do together to stop fossil fuel infrastructure, develop renewable energy, and deal with drought, floods, and wildfire fosters shared values and builds resilient, more active communities. Engaging group actions bring more tangible benefits for enlightening and broadening communities. How to Let Go of the World and Love All the Things Climate Can’t Change seeks to help citizens work together within their community against dangerous climate change. Through the combination of heartbreak and joy, despair and desire for action that the film inspires, 350Sandpoint, PESC, and WIRT invite participants to activate their moral imaginations, raise their individual voices, and connect with local community groups and the regional climate movement, to create a better world powered by renewable energy, justice, and love.